If you are looking to start up a new Web site, or if you are unhappy with where your existing Web site is hosted, you have three basic choices for where you actually put your content. You can use a free blogging service, or use GoDaddy or the services of your domain registrar, or you can pay someone to set up a virtual Windows or Linux server and set it up on your own. The costs vary for each method. Using the Web hosting facility at a registrar such as GoDaddy starts at $5 a month and can be as expensive as several hundreds of dollars a month for the virtual servers. What is the difference? The cheaper plans use pre-set Web sites and aren’t all that flexibly, while the virtual server plans means that you have a complete Windows or Linux OS that is sitting in their data center and yours to set up as you wish. But I like the free option, which makes a lot of sense for several reasons, not just because of the price. First off, blogs are great ways to create a new Web site from scratch. Unlike more traditional Web sites, they don’t require any programming or HTML knowledge beyond knowing a few simple tricks. They have templates for various designs and if you don’t like them you can modify them or create your own, often with a click of a single button. The blogging services are also automatically indexed by the search engines, so one less thing to worry about there. 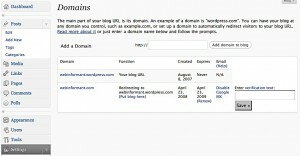 There are free blogging services from three companies – Typepad.com, Blogger.com, and my favorite: WordPress.com. While I don’t do them justice in this tip, I will show you some neat features. The best part is that you don’t need any special software, you don’t have to go to school to learn the text markup language of the Web, and they are free! Let’s go to WordPress.com and see if the name we want is taken. It is so important to pick the right name and reserve all the various places that you’ll be using right off the bat. If it isn’t, the site will bring you to a page where you can set up your blog in a few seconds. The hardest part is picking the right name! Once you have created your blog name, you sign in to your WordPress account with your username and password, and you can get started setting up your blog. There are two things to keep track of – pages and posts. Pages are categories, or ways to enter information that doesn’t change much. Posts are the entries that you write on a regular basis, and the blog shows the most recent first and then backward in time. 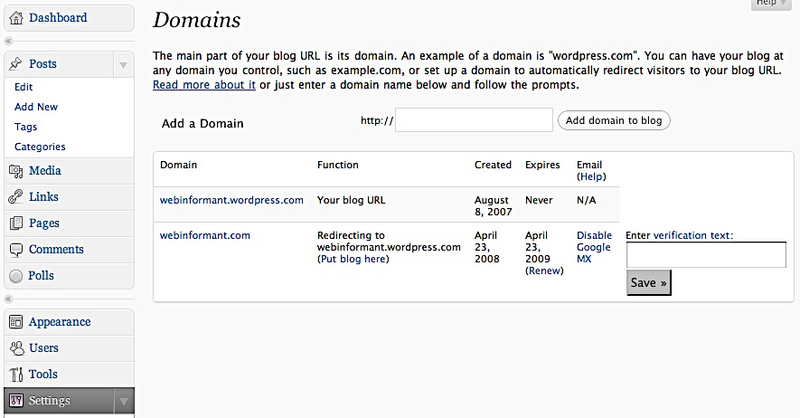 Once you have created a few sample posts, you want to go to your registrar, such as Godaddy, and forward your domain to the WordPress blog that you have created. You can also pay WordPress $10 a year to do this for you, by going into the Settings/Domain section of their administrative menus, such as the screen shot below illustrates. David Strom is an expert on Internet and networking technologies who was the former editor-in-chief at Network Computing, Tom’s Hardware.com, and DigitalLanding.com. He currently writes regularly for PC World, Baseline Magazine, and the New York Times and is also a professional speaker, podcaster and blogs at strominator.com and WebInformant.tv. Great post. Just wondering though with blogs, does your blog page get ranked? Or do they just go to the supplemental? Coz I believe they are all on the same IP addresses. Google doesn’t care when many sites are on the same IP address. If there are thousands and thousands of sites on the same IP, they’ll take a look at that (to make sure it’s not garbage sites) but for something like WordPress.com, it’s all good, they get ranked in the index.